Are you using Google Search Console? If not, you may want to check it out after this latest update, or at least Google is hoping that you will. This new feature has been introduced by Google with the expressed goal of bringing attention to Search Console, but you may be wondering what precisely Google Search console [link] is, and what it—and the new feature—can do for you. Search Console is a free service provided by Google. Google Search Console (formally Google Webmasters) helps you to monitor your site’s performance in Google’s search results and can give you insight into how Google views your site. This will allow you to optimize your performance to improve Search Engine Optimization and then your ranking on Google. If you are a verified site owner, Google may now offer you a condensed view of your website performance statistics taken from Google Search Console, directly in your search results. This teaser view in your SERP is intended to entice you to click on Search Console to learn more about your site. The mini dashboard shows you clicks, impressions, and your average position during the past 28 days, vs the previous period. Included with this view are suggestions from Google on how to improve your site in search. Google is looking to bring more users to their Search Console, which in turn will provide site owners with more information and tools that they can use in order to build a more successful website that will perform better in search. You can see in this example for “SEO Consultant Vancouver” our website is ranked 1st place on Google.ca, and we’ve seen a 23% increase in clicks (visitors to our website) and a 78% increase in impressions (number of people typing in SEO Consultant Vancouver into Google.ca) on a month to month basis. Not all website owners are even aware that Google Search Console exists, and if they are, they may not realize that this is a free tool that can be helpful to them by informing them about how their website is doing with a quick glance, and also directing their attention to any issues with their site that needs to be resolved. Having the dashboard appear to owners will not only raise awareness about the existence of Search Console but hopefully intrigue them enough to check it out and start using it on a regular basis. The guidance and information offered by Google Search Console may also ultimately result in some site owners hiring a developer or an expert in SEO in order to implement the changes that Google suggests. How to use Google Search Console. If you are interested in seeing this new feature for yourself, then there are a few things to be aware of. First of all, you will need to be signed in to the Google account that can access the particular website property in Google Search Console. Following that, you will need to make a search for any phrase or keyword that should come up in search. Upon doing so, and upon having your site appear in the SERPs, you may find the new dashboard displayed for your perusal. Do You Really Want To Improve Your Ranking in SERP? Marwick Marketing is Canada’s leading SEO agency. Certified as a Premier Google Partner Agency, we drive excellent SEO results. 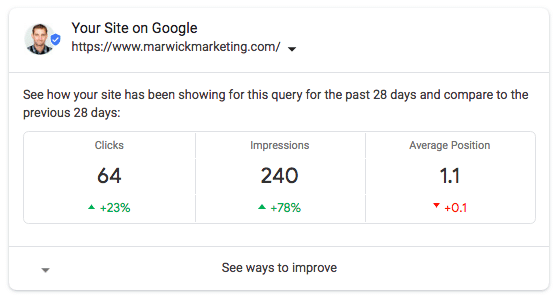 Marwick Marketing is also the highest rated SEO agency in Canada. Check out our reviews on Google. Contact us today and see how we can improve your SEO to increase your business online. ← Which is better for SEO .ca or .com?